As an experienced software developer, in a reputed IT Outsourcing company, CDN Solutions Group, I am always looking forward for every adoption of technology and science. I recently read this Google latest update of Android pay integration in Mobile Apps. Android Pay is Google’s latest attempt in mobile payments network, replacing the old Google Wallet for most of the day to day functions. Unlike Google Wallet did in the past, Android Pay is working in conjunction with world’s major banks and card issuers to make it super easy and secure to make payments with your credit cards in stores that have NFC payment terminals. Bank of America, Discover, and USAA are among the first US-based banks that offer Android Pay Integration feature. Billions of Android users can take advantage of this integration. In previous month Google has announced that some mobile banking apps will offer built-in Android Pay integration. If you are a customer of one of these banks, you can easily add cards to Android Pay from your mobile banking app with just the click of a button with two steps. 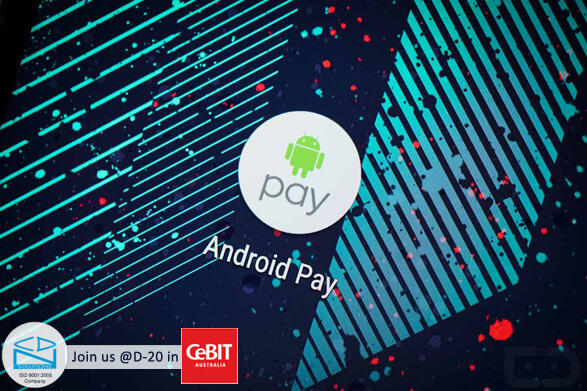 After completing setup, your card is attached and you can use your phone to tap and pay at millions of stores very easily and wherever you see the Android Pay button in your favorite apps and on the mobile web. After each successful transaction Android Pay will also send you a notification. Google makes it very simple and secure, You don’t need to have Android Pay downloaded to your device to use Android Pay. The preceding banks will offer the NFC-reliant ability within their apps. All you have to do is select your default payment card and enjoy shopping with safe and secure way of transaction. So, isn’t it exciting and new! Try that and let us know your views in the comment box below.